Return to an enchanted kingdom filled with adorable creatures in this bubble shooter game. Take control of the magical cannon and pop the bubbles as fast as you can. What’s that in your crosshairs? Why, it’s another villain that you need to eliminate before it’s too late. If you want to end their reign of terror, you’re going to need to fire your weapon when the time is just right. 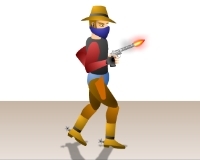 Can you handle all of the thrills in each one of the aim and shoot games in this category? But you won’t just be aiming at tons of bad guys. You can also try out a different set of shooting skills in Soccertastic. How many goals can you make when you go up against this relentless virtual goalie? You can also pop lots of colorful balloons along with the monkey featured in Bloons or cut loose with a barrage of powerful periodicals in Newspaper Boy Brutal. You could always try knocking a piece of fruit off a volunteer’s head with a bow and arrow in Apple Shooter as well. If more explosive action is your sort of thing, there’s tons of games here that involve heavy firepower. Take out all of the targets in Sniper Elite or blast each of the road warriors that are hot on your tail in Max Fury: Death Racer. There’s an army of evil extraterrestrials waiting for you in Alien Attack and a flock of frozen birds ready to do battle with you in Crazy Penguins Wars. You can even join Bart as he blazes a trail across his animated world in Simpsons 3D Springfield. Just be to aim at the right targets in each one of these free online games.